Under the ReWeee Project, sorting centers will run for the first time in Greece for old electrical appliances which are suitable for reuse. Reusing appliances has as a result the conservation of raw materials and energy which are required to manufacture a new product. Reuse plays an important social role, as it offers good quality second-hand appliances to those who cannot afford to buy new ones. 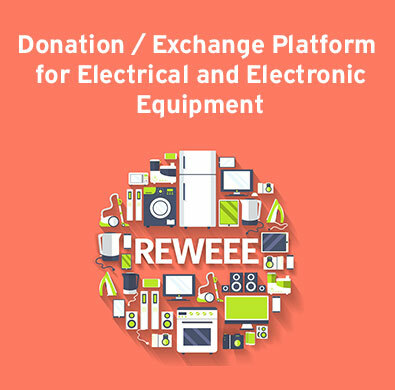 The ReWeee Project aims to prevent the creation of Waste Electrical and Electronic Equipment (WEEE). In order to achieve this objective, two WEEE sorting centers (SCs) will operate for the first time in Greece, in the wider region of Attika and Central Macedonia correspondingly. The core activity of those centers is the collection, the storage and the sorting of WEEE depending on their condition and then their preparation for reuse or treatment. Public awareness is essential for the success of ReWeee. This Project includes a major action which is the development of a web platform for donating and exchanging EEE. That platform will be used by households, companies and public services. Events will also be held promoting the repair of EEE. During the events appliances that can be fixed will be repaired on the spot, giving their owners the opportunity to learn simple repair techniques they can use themselves to fix similar problems in the future. At the same time, a Consultation Forum will be developed to look into, analyze and promote in the Project’s social media topics related to the prevention of creation, preparation for reuse and monitoring of WEEE. In the Forum will participate WEEE- related organizations, agencies and stakeholders in Greece. The objectives of the LIFE RE-WEEE Project falls under the targets prescribed by EU Policy and the current Legislation. The LIFE RE-WEEE project organizes the next repair event “Μαθαίνω να επισκευάΖω" promoting the repair of EEE to the public in Kypseli Municipal Market, Karaiskaki 28 Athens, on Sunday 23rd of Decem.. Enter your e-mail in order to receive our news. Your email was submited successfully! The “ReWeee” project (LIFE14 ENV/GR/000858) is 60% co-funded by the EU LIFE Programme.